I write this for my mother…who has a strange fascination with laundry. My dirty laundry, yes, you will know all my secrets. In my former American life, laundry meant throwing the clothes in the washer along with some laundry detergent, pressing a few buttons, closing the laundry room door, and ignoring the washer for an hour or so. Once the wash cycle completed, mindlessly throwing the wet load into the dryer, twisting a knob and pressing a button, waiting another hour and voila! Lint-free clothes that smell like Tide detergent. Then plopping on the couch and watching “What Not to Wear” while mindlessly folding clothes. Easy peasy. And the clothes smell so nice. Thank you dryer, I love you. And now dryer, I miss you. 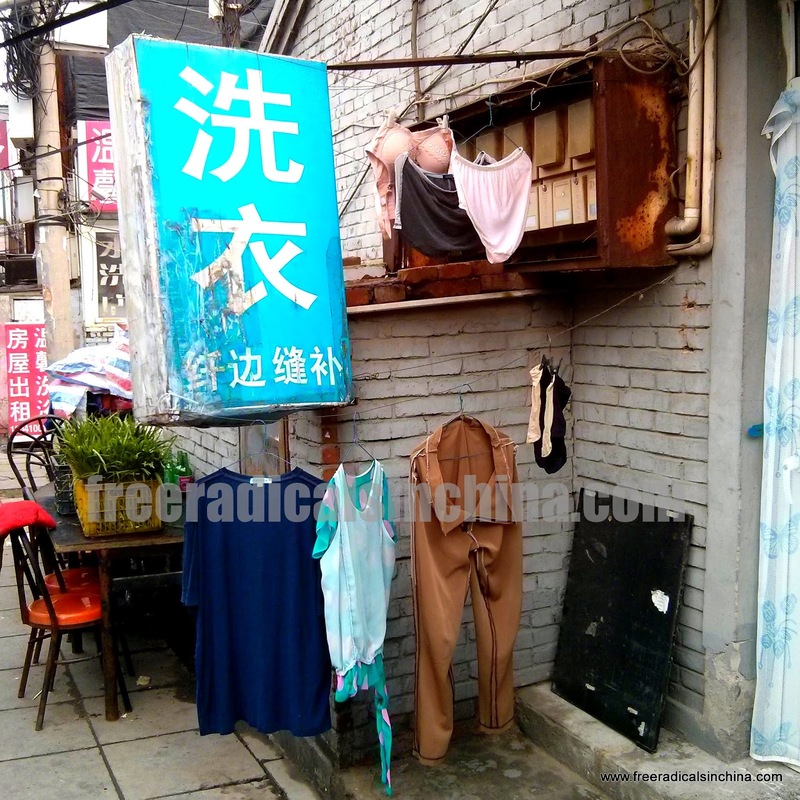 Personal home clothes dryers are rare in China, limited to the Chinese upper-class and professional laundry services. Drying laundry adorns window panes and street corners. Jeans, sweaters, socks, underwear, amongst other personal items are on display for everyone to see. We foreigners are no exception. Just like everyone else, we hang our wet laundry out to dry. My running pants, birdMAN’s white T-shirts, and our underwear along with a mix of other garments suspended from the balcony ceiling rods are like our furniture: always there. Sometimes I forget to hide my unmentionables before people come over. But whatever, everyone is used to seeing other people’s underwear. Doing laundry now still involves throwing a load into the washer, but a cold wash is the only temperature option. And all the buttons are written in Chinese. The washer is on our patio and drains into a drain pipe. This drain pipe empties adjacent to the walkway outside. I wonder how the detergent laden waste water ultimately affects Beijing water sources. Back to laundry. I press a few buttons and let the washer do its thing. The sound of the washer knocking around sounds like a rocket getting ready to go off to space. After about an hour and half when the cycle completes, the washer beeps. Then I take out each piece of clothing, shake off the lint and hang it up to dry in the lovely Beijing air. What? Is there hot cycle option? A dryer would be working overtime battling the dust and lint here. Beijing dust is not like any dust I have ever encountered. The dust invades every crook, cranny, and surface, creating an oily black film sticky to the touch. This same dust accumulates on the towels, bed sheets, and clothing. After washing, the laundry is dotted with little black flakes. Some of these flakes may also be scum accumulation in the washer itself. I read that washers should be cleaned out every three months, which I have never done. So for now, I shake out the wet laundry and sigh as I watch the black flakes float to the floor. Then I vacuum it up. One day I really really scrubbed my kitchen counter with the magic eraser sponge. Ugghhh. Look what BJ dust did! After hanging for a day, the clothes are stiff and wrinkled. Some of these clothes require ironing. All of them require a lint roller. Clothes take a real beating here. First, my clothes get washed a lot. I have fewer clothes now than I did in the US, so I wear the same clothes two, three or four times a week. During the day, I am not in an office or an air-conditioned car. Instead, I am riding around on my bike or sitting in unconditioned places. That means a lot of sweat—especially in the summer. After one wearing, those sweaty clothes go straight to the laundry pile. Second, the clothes get washed in Beijing’s hard tap water. I am pretty sure that is why all my whites are a yellowish hue, and colored ones have a dullish tint. So that’s the laundry blog. Happy, Mom? English translation: Hang the laundry on the balcony to dry. Who needs Downy? Sausage fragrance will do just fine! Last Thursday, birdMAN taught his last English class of the semester. What should we do with all his free time? Study Chinese? Naahh. Let’s go play! For us, the equivalent of playing is eating. So the following morning, we bee lined to our favorite beer and cheeseburger place: Great Leap Brewery. Great Leap is westerner’s haven. It’s clean. It’s spacious. It smells like hops. The bathrooms are not only stocked with toilet paper but also soap. The no smoking inside rule is enforced. The Indian Pale Ale beer is cold and bitter. The flavorful lamb burger is accompanied by a generous side of French fries crisped to golden perfection. After satisfying our American bellies with American-style food and beer, we headed over to a popular hutong* called Nanluoguxiang (南锣鼓巷). Nestled amongst the stuffed pandas and silk slipper stocked shops was a real, genuine, just-like-the-kind-in-California frozen yogurt shop. For 21.5 RMB (3.50 USD), birdMAN and I shared a cup of sheer pleasure: tart frozen yogurt topped with whole almonds, kiwi chunks, and chocolate syrup. You can buy cool stuff in Nanluoguxiang. This picture reminds me of me with my two sisters. Food options appealing to the western palate seem to be popping up all over Beijing. Pizza, Indian, Italian, cheeseburger, and sandwich restaurants are within a 20 minute bike ride of our house. Ok, the available monstrous nachos or chicken burritos may not quite meet California Mexican food standards, but it’s pretty darn good. Eating like a westerner, however, can be pricey for an average Chinese person. A decent western entrée will cost 40 to 80 RMB (6.50 – 13.00 USD)#. An exceptionally tasty entrée at a fancy place will cost more (we don’t go to those places). A pint of Great Leap craft brew ranges in cost from 25 to 55 RMB (4.00 – 9.00 USD). Generally, birdMAN and I will spend about 150 RMB (25 USD) for a splurge meal. Ok, in US dollars, 25 bucks may sound like a cheap meal. But for comparison, our monthly water bill is about 25 RMB (4 USD). A bowl of noodles with vegetables and meat will cost 10 to 20 RMB (1.60 to 3.20 USD). But what can we do? Californians just cannot live on noodles and rice alone. English translation: I am eating really delicious food. (My translation may not be super correct, but you do say this when you eat really delicious food). 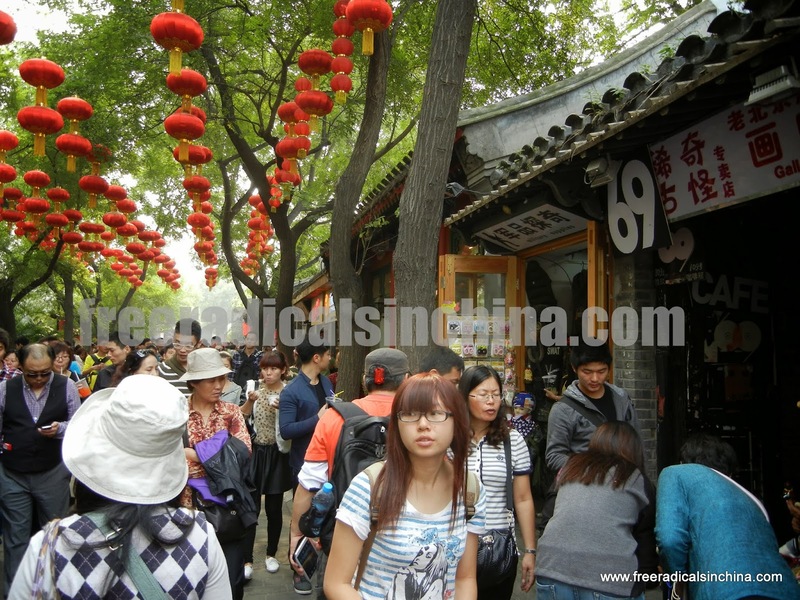 *Hutong 胡同: Hutong is neighborhood characterized by a cluster of narrow alleys. A long time ago, China’s emperors built Beijing’s hutongs to house people according to social class. # Some restaurants offer lunch or dinner specials. Subway restaurant sells a 15 RMB sandwich. One nearby restaurant discounts the 35 RMB chicken burger to 10 RMB every Monday. We take full advantage of such deals! Last February we woke up early to watch the Superbowl at Great Leap. birdMAN is very happy. There's nothing like a beer at 8 am.